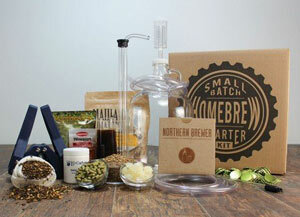 Home > Fun > Beer and Wine > Best Home Brewing Kit: BrewDemon vs Mr Beer vs Northern Brewer vs Brooklyn Brew Shop & More! The craft beer industry has exploded in recent years, giving ale drinkers a wide-selection of flavors and varietals to choose from. It’s also created a culture of beer consumers who have a whole new appreciation for the craftsmanship that goes into creating fine beer. According to the American Homebrewers Association, more than 1.2 million people are brewing their own beer in the U.S. alone. That’s a lot of guzzling! 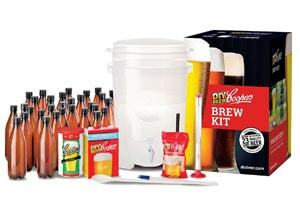 And for good reason since it’s easier than ever to join the movement and brew your own thanks to home brewing kits. No matter your level of passion for beer, there’s nothing more satisfying than enjoying the crisp taste of a frothy beer that you made yourself. It’s not only fun to do, but it’s also more affordable than you might think. We’ve researched the best brewing starter kits available so you can impress your friends and start hoppin’ to it! What Do You Want To Brew? Pretty crazy to think that with a few simple ingredients (hops, yeast, malt, water) and the right tools (fermenter, tap, thermometer, bottles, etc.) you can make your own alcohol. Each beer has its own unique set of products (liquid or dry extracts, kind of hops) but all beer requires you to do three things: boil water and grains to steep into wort, add yeast to turn wort into beer, let it ferment and then bottle it, so it’s carbonated and ready to drink. Sanitation is also critical throughout the process as bacteria can prevent the hops from fermenting properly and will spoil the taste. 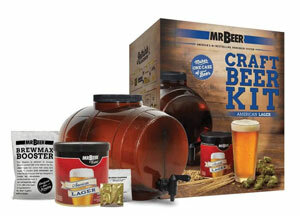 While you could buy all the supplies individually and research the recipes yourself, a beer brewing kit bundles everything you need together for you including step by step instructions to follow. The kits are compact enough that you can store in a small closet, so you don’t need a big warehouse or garage to brew and it only takes as little as one week from start to finish. If you can make a box of macaroni and cheese, you can brew beer. Once you’ve got a few batches under your belt (and in your belly), you can get refill packets which are relatively inexpensive (in some cases, cheaper than a six pack) since you’ll already have all the equipment. That way you can try new types of beers and even drink seasonal beverages throughout the year. Ready to get guzzling? Grab a cold one because we’ve researched and reviewed all the best beer making kits on the market including pros, cons and pricing for each in our home brewing kit reviews below. Started in 2012 by a home brewing industry veteran, BrewDemon set out to make the first patent pending conical fermenter. Its cone-shaped design mimics commercial-sized fermenting systems, yet it’s small enough to produce small batches (2 gallons). It even has a tap built in which makes it easy to brew and bottle your beer. The amber color is designed to block harmful UV rays from damaging your brew and the narrow shaped base collects the trub (aka unnecessary yeast). Their packaging is simple making brewing straightforward and less intimidating for first-timers. They stand by their product with a one-year warranty and have excellent customer service. Because of the compact size and built-in features, BrewDemon is our top pick for smaller spaces. for the Signature Beer Kit (both 2 gallons). Similar to the BrewDemon, Mr. Beer has a fermenter with a built-in locking spigot and is amber in color. The capacity is also the same (2 gallons), but their “LBK” (aka Little Brown Keg) is shaped like a keg and has added built-in venting system to allow C02 to release. The thing that sets Mr. Beer apart from the competition is its large variety of proprietary brewing extracts that work in a range of temperatures. This allows you more flexibility for the space you will use for brewing and thus, less room for error. The premium kit comes with everything you need, including a no-rinse cleanser to use in between batches and 11 reusable shatterproof bottles designed to easily check carbonation levels. You can also brew up future batches with one of 50+ seasonal recipes to enjoy — you (and your palate) will never get bored with Mr. Beer. for premium edition (both 2 gallons). Northern Brewer caters to the home brewers who aren’t looking for shortcuts and that appreciate more of the old school way of doing things. Whereas Mr. Beer and BrewDemon have self-fermenting tanks with dispensers built in, Northern Brewer’s process involves a few extra steps and equipment. However, they have plenty of tutorials and guides to help you along the way and this company prides itself on world-class service. 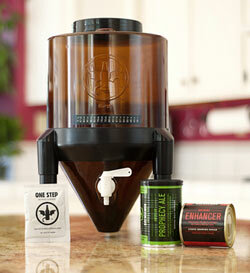 Northern Brewer has eight starter kits that range from a smaller 1-gallon fermenter (pictured) up to a deluxe brewing starter kit. Depending on which option you select, you will have a list of included recipes to choose from to get started. If you have patience and the thirst to learn, then Northern Brewery kits are a great fit for you. for Small batch kit (1 gallon). Brooklyn BrewShop was founded by a couple in their 20’s who are passionate about making home brewing easy and affordable for everyone. In 2009 they set up in Brooklyn’s famous flea market spreading the word about creating your own beer using simple ingredients. Their kits are now sold in stores across the U.S. Like Northern Brewer; they use glass jugs as their fermenters; however, Brooklyn’s BrewShop process has slightly less equipment and steps involved. The only thing you’ll need is a stock pot, funnel and strainer (which are sold separately if you don’t already own them). We love their selection of delicious mixes (including some special editions and collaborations) branding and beautifully designed packaging. Because they are more of a mom and pop company their website isn’t super high-tech and they lack customer service support that other companies provide. They are the most affordable starter kit of our top picks and for the quality of equipment and beer taste, you can’t go wrong with this kit, making it our best pick for newbie brewers. This two-minute video briefly walks you through the steps to brew at home using one of their starter kits. The process is more or less the same for the other home brew starter kits just slightly different equipment and products. While those are some of our favorites for each respective category, here are some other of our top recommendations. Because they are outside the U.S. their measurements are in liters, so don’t let that throw you off in the recipes. But those Aussies must love to drink because their bottles are 25 oz (the size of a bottle of wine). Bottom’s up! Cooper’s has video tutorials (complete with an Australian accent), a database of online resources and plenty of options for customer service support (including a brew hotline). Another great feature about Cooper’s is their iPhone app which tracks your inventory, keeps brewing notes and flavor profiles, and more. for 6 gallon kit with 30 bottles. 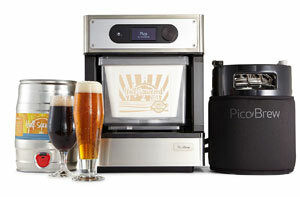 Picobrew raised more than a million dollars on Kickstarter to bring ready to brew beer making machines to homes worldwide. The crème de la crème of home brewing, it’s an appliance that does all the heavy lifting for you. Pico has partnered with 100+ breweries around the country to create PicoPaks that are basically pods that you insert into the machine (in addition to their own brews). The Picobrew computer recognizes the type of beer from the packaging and then you can use the dial to customize certain elements to your liking. The stainless steel design is sleek enough that you won’t be embarrassed having a home brewing kit out on your kitchen counter. The only down side is the price tag, though it could be worth it to have draft beer on demand with the push of a button. What Will You Brew Up? 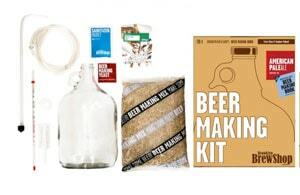 Whether you are giving a home brew kit as a gift or planning to use it yourself, at home beer making is fun for the whole family (well, those over 21 anyways). Even kiddos can help with the bottling action, though. It’s a craft that many are turning to not only for pleasure but also to be eco-friendly. It’s also an effective way to save money on that expensive craft beer. Once you invest in the kits, refill packets are inexpensive and yield a large volume of beer. It might take a little time to create, but it’s well worth it in the end. So cheers to that, and now it’s time to brew your own beer! If you don’t want to brew yourself but still want monthly access to great beers, read our beer club reviews. What excites you most about home brewing? We got the Brooklyn Beer Shop kit thanks to your review and LOVE it! Making beer was easy and fun (even for my husband who doesn’t really get into these sorts of things) – have yet to try the beer as it is still fermenting but excited to see how it turned out!